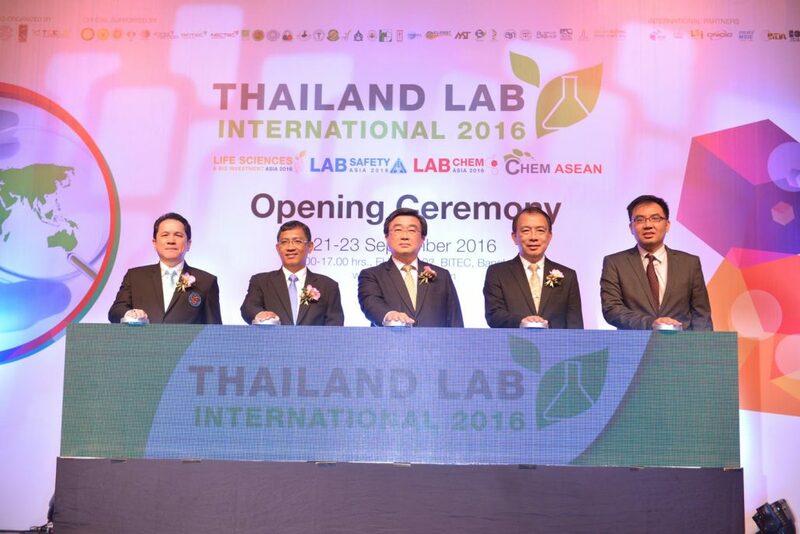 Associate Professor Dr. Weerapong Paesuwan, Permanent Secretary for the Ministry of Science and Technology said that Thailand LAB INTERNATIONAL 2016 is the largest international trade exhibition and conference on Analytical Laboratory, Equipment and Technology in South East Asia. It is harmonized with the government policy to transform Thailand to innovation-driven economy, using science, research and technology as tools towards commercialization. It is established on public-private partnership platform, including international networking. Permanent Secretary for the Ministry of Science and Technology also said that the Ministry’s goal is to increase the country’s research, development and innovation (RDI) spending to 1% of GDP or 130 billion baht by 2017, with the private sector contributing 70% of the total. Although at present Thai RDI spending is equal to 0.5% of the country’s GDP, the Ministry is confident to reach the goal soon with a number of new government approaches and supports such as work integration among government agencies and private sectors, tax and financial incentives, the Board of Investment (BOI) privileges, Talent Mobility program, SMEs and OTOPs Technology Assistance Program, National Quality Infrastructure Program, etc. Dr. Phichet Banyati, Deputy Director General, Department of Medical Sciences, Ministry of Public Health said that the Department of Medical Sciences aims at promoting strategies to resolve health concerns, particularly in research and development. When the government’s goal is clear on increasing the country’s RDI spending, and promoting the use of laboratory equipment and new technology, Thailand will attract more international investment. He was confident that Thailand LAB INTERNATIONAL 2016 would provide the right platform for RDI and help advancing laboratories in and outside the country. In agreement with the view of Mr. Teerayuth Leelakajornkij, Director of Sciences and Technology Division, VNU Exhibitions Asia Pacific, the increase in RDI spending should benefit the industry of science and technology laboratory equipment. It will raise awareness of quality and standard in manufacturing and industry, leading to a larger market demand in laboratory equipment. It will also utilize and give importance to new tools and technology that focuses more on reaching more accurate and reliable measurement and testing. The needs and necessity of medical and public healthcare will also help in increasing RDI investment, as well as creating a new industry such as life science industry. Thailand LAB INTERNATIONAL 2016 will be held until 23 September 2016 on 10,000 square meters of EH 101-102, BITEC, Bangkok. The cutting-edge technology will be presented and showcased by 1,300 brands of 350 exhibitors from 35 countries plus 6 country pavilions. The international exhibitors grow by 83% and the show believed to generate business transaction worth more than 3,000 million baht, compared with last year number. Thailand LAB INTERNATIONAL 2017 will occur from 6-8 September 2017, EH101-102, BITEC, Thailand.